District 14: Senator Craig Zucker, Delegate Pam Queen. Delegates Anne Kaiser and Eric Luedtke were endorsed in the first round. District 15: Delegate candidate Lily Qi. Senator Brian Feldman and Delegates Kathleen Dumais and David Fraser-Hidalgo were endorsed in the first round. District 16: Delegate candidate Sara Love. Senator Susan Lee and Delegates Ariana Kelly and Marc Korman were endorsed in the first round. District 17: Delegate candidate Julie Palakovich Carr. Senator Cheryl Kagan and Delegates Kumar Barve and Jim Gilchrist were endorsed in the first round. District 18: Senate candidate Jeff Waldstreicher, Delegate candidates Emily Shetty and Jared Solomon. Delegate Al Carr was endorsed in the first round. District 19: Senate candidate Ben Kramer, Delegate candidate Vaughn Stewart. Delegates Bonnie Cullison and Marice Morales were endorsed in the first round. District 20: Senator Will Smith, Delegate Jheanelle Wilkins. Delegate David Moon was endorsed in the first round. District 39: Senator Nancy King, Delegate candidate Lesley Lopez. Delegates Kirill Reznik and Shane Robinson were endorsed in the first round. Every MoCo incumbent running for reelection was endorsed. Two Delegates running for Senate, Jeff Waldstreicher and Ben Kramer, were also endorsed. The full statewide list can be seen here. The big winners here are the non-incumbent House candidates looking to distance themselves from competitors, including Qi (D-15), Love (D-16), Palakovich Carr (D-17), Shetty and Solomon (D-18), Stewart (D-19) and Lopez (D-39). Lopez is a really big winner because she gets to talk about something other than the District 39 slate controversy and she interrupts a growing slew of labor endorsements for her most viable rival, MCGEO employee Gabe Acevero. Interestingly, the Sierra Club did not choose between the leading two District 20 open House seat contenders, Lorig Charkoudian and Darian Unger. We are tracking prominent institutional endorsements and will post a summary list soon. 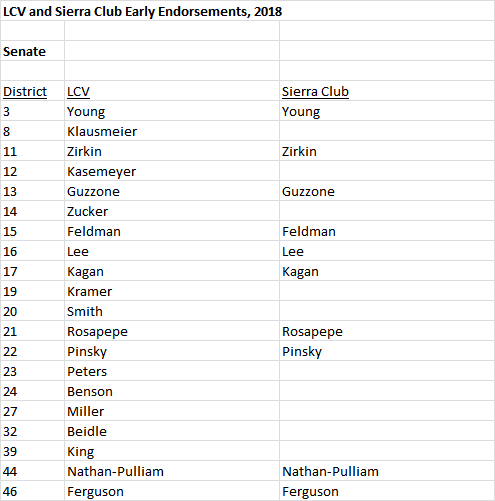 Yesterday, the Maryland League of Conservation Voters (LCV) released its early endorsements for General Assembly. We present them along with the early endorsements recently issued by the Maryland Sierra Club below. First, let’s look at early endorsements for the Senate. 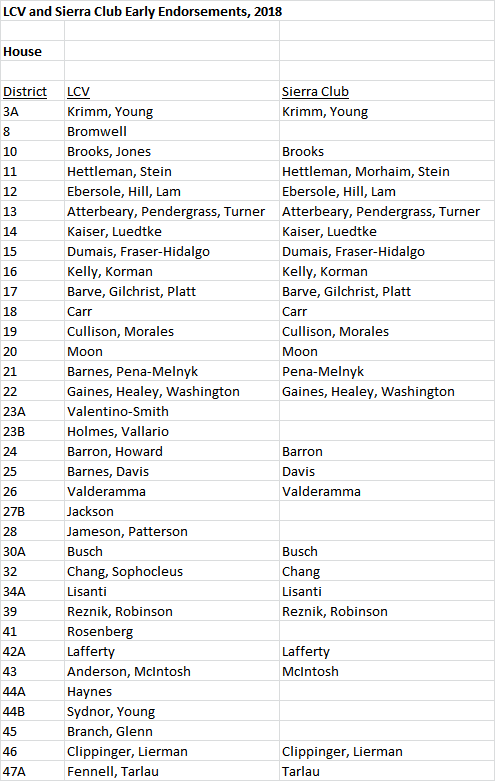 All early endorsees for Senate are Democratic incumbents with two exceptions: LCV-backed Delegates Ben Kramer (D-19) and Pam Beidle (D-32), who should have little problem winning their party nominations for open seats. In general, the Sierra Club has endorsed fewer candidates so far. Both organizations took passes on several contested Senate races. They notably declined to support Education, Health and Environmental Affairs Committee Chair Joan Carter Conway (D-43), who is being challenged by Delegate Mary Washington. However, both of them did support Senator Shirley Nathan-Pulliam (D-44), who is being challenged by SEIU leader Aletheia McCaskill. Now let’s look at the House. Again, all the early endorsees are Democratic incumbents and the Sierra Club supported fewer of them. Many of the incumbents who have not yet been endorsed are appointees who have not served for three full sessions, like Montgomery County Delegates Pam Queen (D-14) and Jheanelle Wilkins (D-20) and Baltimore City Delegate Robbyn Lewis (D-46). Let’s remember that both of these organizations will be issuing more endorsements in the future. Several incumbents who don’t appear on these lists now could be endorsed in the next few months. Open seat candidates will also earn support. And the endorsement decisions in the contested Senate races, especially in the City of Baltimore, will be very interesting. We will be watching!